The hybrid library system is a modern technology usually installed in libraries to enhance security and check-in/out process of the library. Two technologies, namely RFID and EM are implemented together to create a hybrid library system. Here, RFID stands for the Radio Frequency Identification whereas the EM stands for the Electromagnetic. 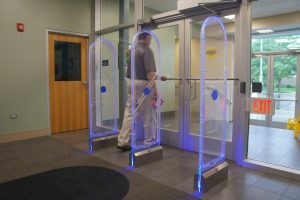 The usage of RFID is involved in security systems of libraries whereas the EM is used for the check in/out process. These technologies are usually implemented by library authorities to ensure their security along with maximum performance. The hybrid system includes tools like a radio antenna, a electromagnetic pass way for the exit, and computer systems with information of all the books in the library. 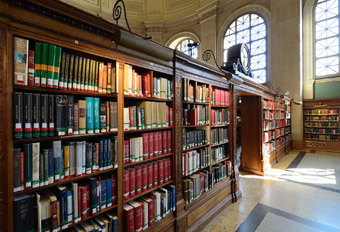 With this technology, all the books in the library are tagged containing details of every book. Through a radio antenna, radio signals are emitted covering limited distances of the library’s perimeter. When the signals from the antenna interfere with signals from the tags on the books, they are interpreted by the computer system. This way, the computer system receives the details of the books through the radio frequency. This frequency is later decoded to a user friendly form, making it quite easy to keep records of all the books. Thus, if any book from the library enters, it will be immediately interpreted into the library systems. The electromagnetic system helps prevent any unauthorized checkout of books or any kind of tampering of pages. All the books in the library are pasted with an adhesive tape which emits a signal when brought to an electromagnetic field. In fact, the signal of every book is different. When any book proceeds to check out without authorization, a signal is emitted by the book which is received by the electromagnetic pass way at the exit an alarm goes off.